Solar Entertainments are a full time, professional, award winning entertainments business, specialising in providing high quality, great value mobile karaoke hire and disco hire for Private Parties, Corporate Events and Weddings throughout South Yorkshire. As members of the National Association of Disc Jockeys, Alliance of Mobile & Party DJs and holders of a highest Diamond DJMark award, we provide a professional, top quality service from initial enquiry through to event completion. For full details on each of our services please select from the top menu or see below for our South Yorkshire disco and karaoke hire services. All of our discos are fully tailored to our customers' requirements and hosted by a professional, highly experienced DJ. We work hard before and during your event to ensure we provide you with great entertainment suitable for your event and guests. 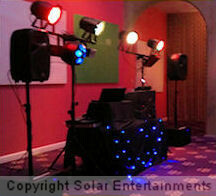 Click here for more information on our South Yorkshire disco and DJ hire services. In addition to our professional disco services, we can provide first class karaoke facilities too. Using top quality, modern equipment and an extensive, high quality range of backing tracks, we can provide karaoke that singers of all abilities can enjoy. 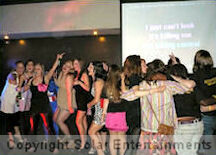 Click here for more information on our South Yorkshire karaoke, disco and DJ hire services. If you would like a do-it-yourself karaoke set up, we have the perfect solution for you. Compact and easy to use, yet powerful and great sounding with a large digital karaoke collection. All delivered, demonstrated and collected from you for minimum fuss. 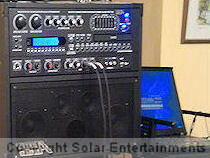 Click here for more information on our South Yorkshire karaoke machine hire services.